The original wire storage system! • Unique Design: The open wire design of these heavy-gauge carbon-steel or stainless steel shelves minimizes dust accumulation and allows a free circulation of air, greater visibility of stored items and greater light penetration. 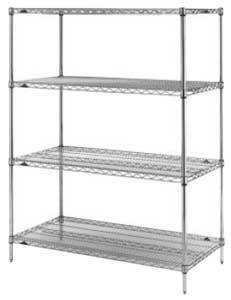 • Versatile Construction: Super Erecta Shelf® wire shelving can change as quickly as your needs change. By using various accessories, hundreds of shelving configurations become possible. • Fast, Secure Assembly: SiteSelect™ Posts with the triple-groove visual guide feature, have circular grooves at 1" intervals and are numbered at 2" intervals. A patented, tapered split sleeve (plastic or aluminum) snaps together around each post. Tapered openings in the shelf corners slide over the tapered split sleeves providing a positive lock. Shelf is assembled in minutes without the use of any special tools. • Shelf Ribs: Run front to back, allowing you to slide items on and off shelves smoothly. • Shelf Accessibility: Shelves can be loaded/unloaded easily from all sides. This open construction allows use of maximum storage space of cube. • Adjustability: Shelves can be adjusted at 1” (25mm) intervals along the entire length of the post. • Durable: Super Erecta Shelf® wire shelving is available in four options: Super Erecta Brite™, chrome-plated, stainless steel and Metroseal™.